My friend Clarice didn't want to eat anything heavy for our dinner date, which meant no rice to our meals. So I went ahead and looked for a Chinese or Japanese restaurant that would cater to her request. Good enough, Yaku Japanese Grill came into sight. 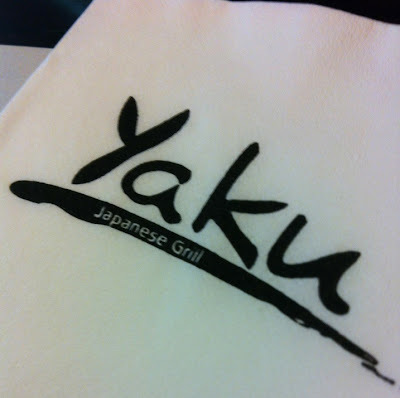 Yaku can be located on the 3rd floor of the Podium Mall, Ortigas. It's sort of hidden from sight. But you'll know you're in the right track when you see a Toy Store and a chinese restaurant on the left side of the floor area. I went ahead of Clarice and asked for seats, and was lead to a corner beside the doors. The place wasn't packed that night, so I was given a nice seat amidst such lovely interiors. At first look you would think that we'd be dining on our knees (much like how the Japanese would sit on the floor through their meals). But I was actually surprised when these were just regular, pillow-cushioned benches. The arrangement just had that 'caved in effect', so it was truly a perfect setup! While waiting for Clarice, I ordered some house tea and a bowl of Yasai Salad. The salad contained shreds of cabbage, tomato, cucumber, carrots and bell pepper. The dressing for it was tangy yet had that nutty aftertaste. The verdict? Well, it was the best tasting salad that I've ever savored by far (second to Caesar Salad). It also blended well with my complimentary dish of 'tuyo' (dried salted fish). We ordered several more cuisines as soon as Clarice arrived. She ordered her usual favorite of Sashimi, followed by a Beef Yakiniku order. I, on the other hand, requested for some Enoki Bacon (thin mushroom pieces that's wrapped in bacon strips), Calamansi Juice and another round of Yasai Salad. Yes, another bowl of Yasai! It was that sumptuous!!! Yaku's Sashimi was also to die for! It was served to us fresh, so we couldn't resist not gorging on these right away. It also went perfectly well with some soy sauce and Calamansi. By far, those pieces were the most freshest, softest Sashimi slices that I've ever taken a bite of! The Beef Yakiniku also complemented the other viands that we ordered, especially when paired with our Yasai Salad. Clarice was even amazed on how both dishes really tasted superbly. We also ordered the Enoki Bacon, twice! The sweetness and the oils of the bacon truly immersed in the mushrooms. Every bite into this Japanese dish was utterly good! I must say that Yaku has a very nice ambiance. Very inviting. Too bad, I don't know how to go to Podium. Do they have other branches here in Metro Manila? Hi Mai! That's very nice of you. I'm from Manila pa. Bale, my landmark or starting point would be the LRT Line 1. Hey Aki! No worries. :) Which station, to be exact? So I can provide you the closest direction/s. :) You can also message me on my Facebook Page. In that way, we can converse more directly. Here's the link: https://www.facebook.com/budgetbiyahera Hope to hear from you soon!